Fluke 62 MAX+ Infrared Thermometer - John Cribb & Sons Ltd, UK Electrical Distributors, Dorset, Hampshire, Wiltshire, Somerset & the Isle of Wight. Takes the heat. And the dust, water and 3-meter drop. 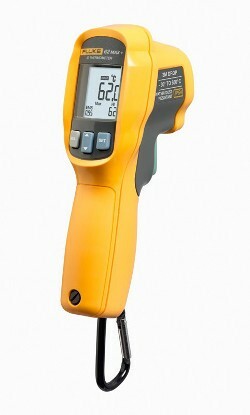 The Fluke 62 MAX and 62 MAX+ are the only mini IR thermometers you can handle without care. Temperature range -30 °C to 650 °C (-22 °F to 1202 °F).